This year, Kristanna Loken is one of the international Judges of the Part Art and movies Awards. We had the chanceto make a nice interview with her.. she is an American actress popular for her roles in the films Terminator 3: Rise of the Machines (2003), BloodRayne (2005) and Bounty Killer (2013) and on the TV series Painkiller Jane (2007)..
Q : Hello Kristanna, at Mulderville we loved your performances in Terminator 3: Rise of the Machines (2003), or BloodRayne (2005) just to name a couple. Can you tell us about your background and how you became an actress with Academy Boyz in 1997 ? Kristanna Loken : Since I was a little, tiny, girl I wanted to be an actress. I started from a young age with various types to dance lessons, horseback riding, singing, and theater. This was great prep work for pursuing a career as an actress. Q : You are on the member of the jury of the Paris Art & Movie Awards. Which short movies are your favorites so far ? What do you like in the short films that may be special ? Kristanna Loken : Because a short film has very little time to get it's point and theme across, it's important that the content and subject matter grab you right away. For this reason, I think the uniqueness of a film is what makes it stand out and what makes it special. Also, I think it's important that a short film (like a feature), still has a beginning, middle and end and that It's characters are fleshed out and have strong intentions. Q : You appeared in Leathal Weapon, currently screening in France. Can you say a few words about your character Adriana Stabilito and how you got on the show ? Q : Which remembrances do you keep about your work on Terminator 3: Rise of the Machines (2003) and particularily your faceof with Arnold Schwarzenegger ? Kristanna Loken : "Terminator 3" was an incredible experience, and time of my life for many reasons. I worked with the best of the best in the business, and was able to showcase my ability on a worldwide stage which opened many doors. I learned a lot by working with Arnold like; precision in fight sequences, interacting and being gracious with fans, and how to keep a positive attitude on set while doing serious work. Q : What would be for according to you one of the keys to succeed with a lasting career in Hollywood, especially nowadays ? Kristanna Loken : Find and stay true to the artist in you. Study, study, study, and keep your eyes open as one never knows what opportunities lie ahead. Q : What for you is the main difference between working on a film versus a tv series? What do you consider to be the advantages or best sides of each type of production? 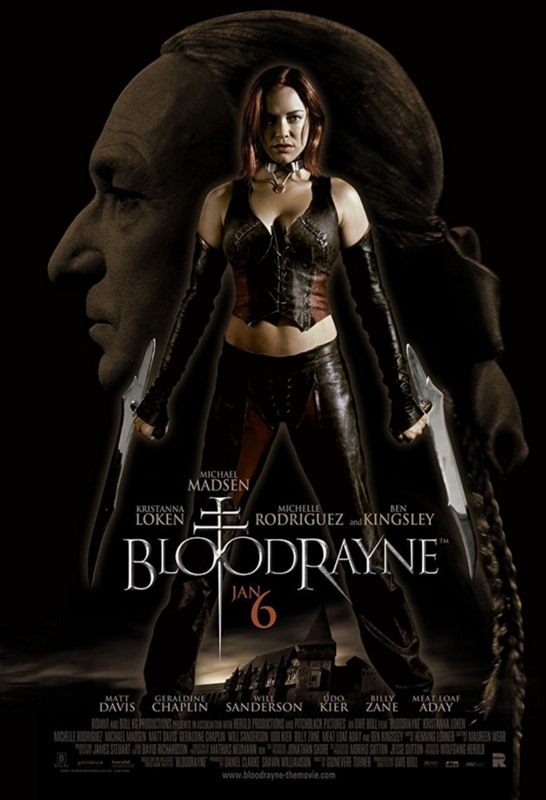 Q : You have worked several times with the director Uwe Boll (Bloodrayne (2006), (In the Name of the King : A Dungeon Siege Tale (2007), Darfur (2009)). What is it you value about this collaboration ? Kristanna Loken : I really enjoyed making and co-producing "Attack on Darfur". Based on the genocide in Sudan, the film was taken from a 30 page treatment and the characters improvised based on the outline of the reality of the situation. We recreated a Darfuri village, and the people interviewed were actual Darfuri refugees. I thought this concept was bold and made for a powerful film. Q : You are now a producer also. What are your upcoming projects ? Q : Would you ever consider directing a film ? Kristanna Loken : Yes, that will be happening sooner than later! Very excited! Q : Which films do you consider to be the most important in your career, and why? Q : Could you pick one French and one American director you would like to work with ? Kristanna Loken : I'd like to work with Paul Haggis, Kathryn Bigelow and Luc Besson. Q : What kind of advice could you give to someone who would like to work as an actor ? Kristanna Loken : One can always continue to grow as an actor. Study with the best acting teacher you can find. Watch human behavior and be impressed. Find compassion for all humanity, even those who are very different than you. BELIEVE in yourself, and never give up! Q : Any anecdote about the movie Repeater directed by R. Ellis Frazier ? Kristanna Loken : The border crossing you see in the film is real, Tijuana, Mexico into the U.S. I am actually driving the vespa through real traffic! Q : Anything you’d like to say to your French audience ? Kristanna Loken : Thank you for your continued support through the years. My best work is yet to come, so keep a look out for updates on my social media. I hope to see you in France soon!